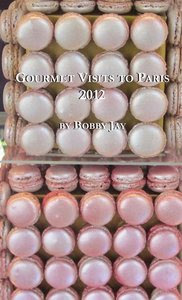 I have just completed the 2012 edition of my Gourmet Visits to Paris, a small idiosyncratic guide to food related things for those contemplating relatively short (three- to five-day) visits to Paris. My favorite restaurants, markets, food shops, kitchen stores, etc. Just click on the cover picture below to get a pdf of the whole document. For optimal viewing, I advise shrinking it to 100% and setting the two-page display option. I am working on changing this pdf so that it opens and looks like a book, so stay tuned. Lots of excellent info here! I love French cuisine. I spent a few weeks in England and then went to France for a week. While England was very exciting, the cuisine left a lot to be desired in my opinion. Food was bland, greasy, and lukewarm -which is odd since it appears it has been lost in its own pub history with all of the fresh seafood and other meats available. Needless to say, my taste-buds exploded when I reached France. All of the sudden there were variations in scents, subtle flavour bases, and even more textural differences. Almost as though the whole aroma and ambiance of the dinner table was transformed. I will never forget cracking créme brulee for the first time in France! Thanks for bringing back such great memories! Good post!